Was a Pilgrim a Puritan? Was a Pilgrim a Puritan? Good Question! The Pilgrim and Puritan were extremely similar in most practices and beliefs. 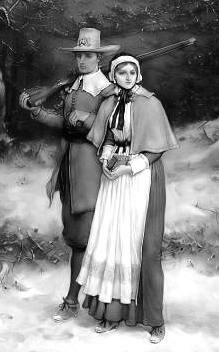 A pilgrim was a distinct type of Puritan. A Pilgrim adhered to more extreme views than a Puritan. The Pilgrim and the Puritan were both strongly opposed to the Catholic Church. Both the Pilgrim and the Puritan colonists believed that the Church of England, the Anglican church, should make more reforms to get rid of all traces of the Roman Catholic Church. But but the Pilgrim was a member of a distinct group of puritans who were not only against the Anglican church but also called for total separation from the church, a dangerous religious belief in England. Both the Pilgrim and the Puritan wanted religious freedom. The Pilgrim Fathers left England for America in 1620 looking for religious freedom. In 1630 another religious group left England in search of religious freedom. This group was called the Puritans. Seeking religious freedom was a strong motivation for colonies in America. The Pilgrim and Puritan practised strictness and austerity in their religion, lifestyle and conduct. A Pilgrim and Puritan was strongly opposed to sensual pleasures and strong advocates of propriety, modesty and and decorum. Puritanism essentially wanted to replace Anglicanism and its ecclesiastical system with the system proposed by John Calvin. Calvinism (also called the Reformed tradition, the Reformed faith, or Reformed theology) held the belief that all humans were born sinful and only God s grace (not the church) could save a person from hell. Dissenters were people objected to the accepted doctrine of the established church. 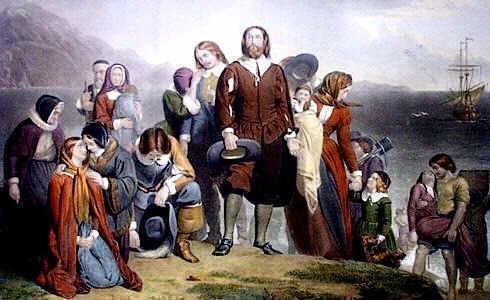 The Pilgrim and Puritan men and women who migrated to America were dissenters from the Church of England who wanted to create a new church in the colonies. The Pilgrim and the Puritan were both looking for religious freedom. The opportunity to worship, in the way they wanted, without fear of persecution. The Pilgrim and the Puritan were intolerant any other religions. The Pilgrim and the Puritan were dissenters. The Puritans wanted the Church of England to become pure by getting rid of Catholic practices. The Puritan wanted to "purify" the Church of England of its remaining Catholic influence and rituals and to return to the simple faith of the New Testament. The Puritans did not want to separate entirely from the Church of England. The Puritan wanted to make reforms or changes. The Pilgrim believed that the Church of England was too corrupt to ever be purified, and that Puritans should completely separate from it. These people were called separatists. The group of separatists, who would became know as the Pilgrim Fathers, left their country and the Church and England behind them (after being imprisoned for their beliefs) and moved to the Netherlands (Holland) to escape religious prosecution. Their leader was William Brewster who published a number of religious pamphlets while in Leyden which were directly critical of King James I of England and opposed the main principles of the Church of England. Authorities in England go to the Netherlands to arrest Brewster but he escaped arrest. The group read a book by John Smith who had established the first colony at Jamestown in Virginia. The book was called "A Description of New England" and it inspired the extreme Puritan members of the group to undertake a perilous sea voyage to set up a colony in the New World, Plymouth. These people were the Pilgrims.